The publication of the extensive 7-volume work Comprehensive Molecular Insect Science provided library customers and their end-users with a complete reference encompassing important developments and achievements in modern insect science, including reviews on the ecdysone receptor, lipocalins, and bacterial toxins. 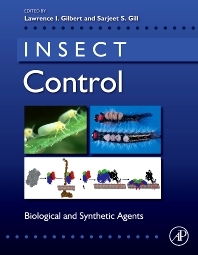 One of the most popular areas in entomology is control, and this derivative work, Insect Control, taps into a previously unapproached market – the end user who desires to purchase a comprehensive yet affordable work on important aspects of this topic. Contents will include timeless articles covering insect growth- and development-disrupting insecticides, mechanisms and use of Bacillus thuringiensis, biology and genomics of polydnaviruses, pheromones: function and use in insect control, and more. New summaries for each chapter will give an overview of developments in the related article since its original publication.